It's supposed to be Spring, but it's been dreary and cold in New Jersey the past two days, making me want to lay in bed with the covers over my head. 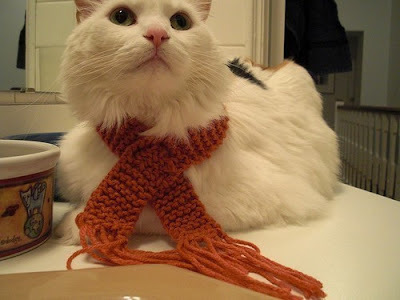 If you're in a similar situation and your cat has been feeling the chill too, then why not invest in a custom sized kitty scarf, hand knit by Esty seller, Squishe! 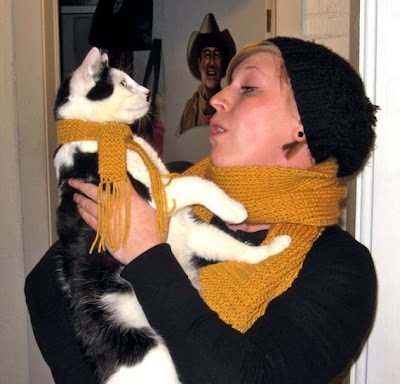 Squishe, AKA Michelle, will make the scarf in any color you desire (solid or stripes), and even offers this beyond adorable set so you and your cat can be cozy twins! Or maybe you're a knitting novice, but would like to craft your own creation, and don't know where to start? 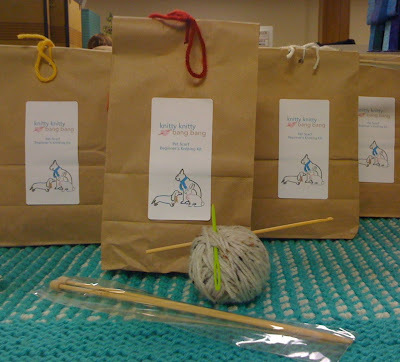 Have no fear, Squishe also sells a Pet Scarf Beginners Knitting Kit, that comes complete with everything you need to make a scarf to fit kitties, bunnies, and small doggies with up to a 10" neck size. If all that wasn't enticing enough, as a member of Etsy For Animals, Michelle donates 10% of her sales to the Maxfund Animal Shelter in Denver, CO. I give this Etsy find two paws up! Wow those are so cute! Too bad my cats would try to smother me in my sleep if I tried to get them to wear one! But they really are very adorable! Au and Target would see this as torture. But scarf tugging might be fun. Well, they're cute, but Spitty don't wear no scarves. Nor any other kitteh clothing, except his own beautiful black furz, which need no accessorizing. Hrrumph. The Human had best remember this.